Identification: Can be quite variable. Female is larger than the male; male is darker and redder. Upperside of forewing is yellow to brown and the median area is lighter than the surrounding areas. The wing may have scattered small brown spots. 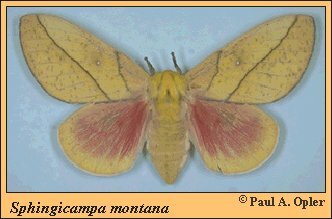 Upperside of hindwing is yellow to brown with varying amounts of red. Wing Span: 2 7/16 - 3 5/16 inches (6.2 - 8.4 cm). Life History: Adults emerge in early evening and mate later that night. The following evening the females lay their eggs. Young caterpillars perch on the undersides of petioles and feed on the leaf bases. Older caterpillars cut through petioles partway and bend down the leaves in order to feed on them. Caterpillars pupate and overwinter in shallow burrows underground. Caterpillar Hosts: Large-leaved cassia (Cassia emarginata) and Haematoxylon brasalita in Mexico, probably Mimosa or Acacia in Arizona. Habitat: Washes in thorn forests. Range: Santa Cruz and Pima counties in southern Arizona, south into the state of Jalisco, northwestern Mexico. Conservation: Inventory populations to determine conservation status.